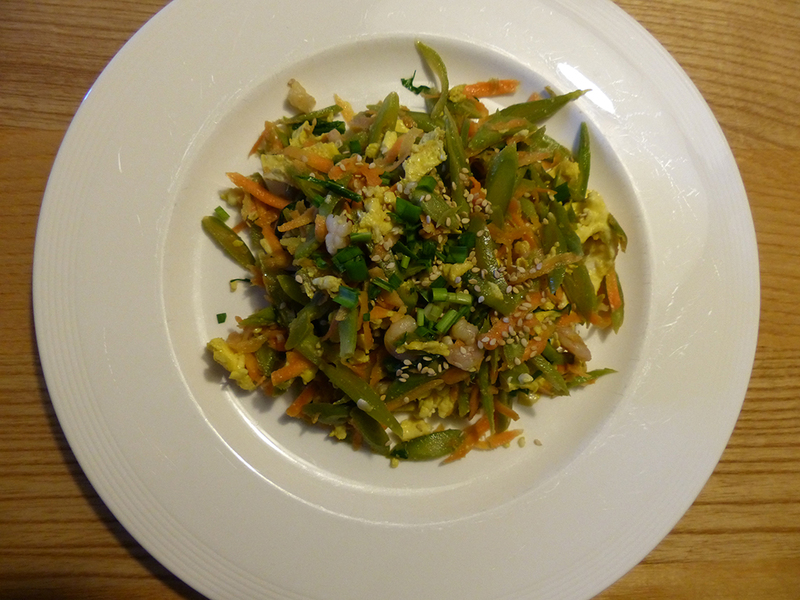 This simple stir fry / salad is both seasonal, healthy and tasty. Serve with (gluten free) bread or noodles. Cut the runner beans in pieces and cook for around 5 minutes until tender. Take out of the cooking water to drain. Cut the pak choi and add to the runner bean cooking water and cook for around 2 - 3 minutes. Peel and grate the carrot and mix together with the runner beans, pak choi, sesame oil and tamari sauce. If you have defrosted the peeled & cooked prawns, you can either drain them and use them or add the prawns to a frying pan and gently heat for around 5 minutes. Put aside. Beat together the eggs and water. Heat the oil in a frying pan and scramble the eggs. Mix together the vegetables with the prawns and scrambled eggs. Sprinkle with the spring onions and sesame seeds. If using noodles, you can cook them now following the instructions and serve with the salad or serve the salad with (gluten) free bread.